The E-VO Concept Series is the new range of WAREWASHING EQUIPMENT by Fagor. Fagor Industrial is the leading manufacturer of machinery for the hotel and catering sector in Spain and tenth in the world. MAKE IT SIMPLE. MAKE IT POSSIBLE. Fagor have gathered all the benefits and features from high-end ranges and provided them in the Concept Series. Built in durable stainless steel with electromechanical components and digital controls for a user friendly-operation. CONCEPT+ ranges offers a highly efficient and effective washing and rising system (EFFI-WASH & EFFI-RINSE) becoming the perfect solution for those locations with low pressure water network and high production requirements. CONCEPT+ has arrived, simply possible. To learn more about the Fagor Machines we offer, call us on 1300 217 411 or complete your details in the form to the right. Fagor Industrial is one of the world’s largest manufacturers of catering equipment, and this includes a wide range of industrial dishwashers. 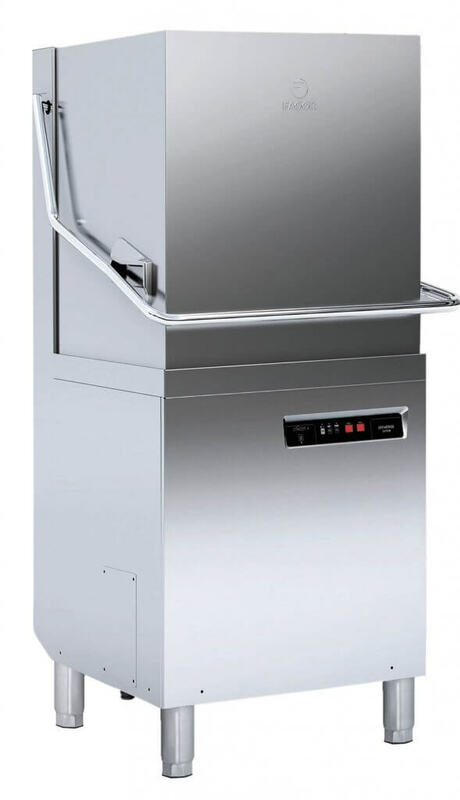 From hotels to restaurants, their dishwashers can be found in many food service environments, and have been specially designed for busy kitchen environments. With plenty of features to help keep your kitchen running smoothly, Fagor is an excellent choice for those in the catering industry. Fagor was founded back in 1960 when they started making ovens for the catering sector. Over time, their business evolved to create other appliances from dishwashers to laundry equipment, all designed for the hospitality environments. Having won awards for quality, they have developed an excellent reputation in the industry. Although Fagor’s products are complex, their operation is simple and designed for busy environments. By choosing a Fagor commercial dishwasher, you can be sure that training staff in its operation will be easy, and the digital controls mean you can start the washing cycle with a touch of a button. 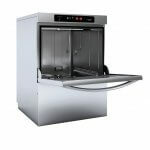 Many of the models have a digital temperature readout, allowing you to ensure dishes are properly sanitised, and features such as an easy-lift hood to avoid strain on the operator. There’s no need to add detergent for each load, as this can be completed using the automatic dispensing features. Cycles between 60 and 120 seconds can be easily chosen, depending on the level of dirt. If you’re considering one of these industrial dishwashers, then it’s important to get advice from the experts to ensure you get the right model. Warewashing Solutions have over 20 years’ experience, and can advise on the best appliance for your kitchen. Front-loading dishwashers by Fagor sit under the counter, so they take up less space. 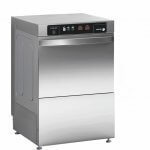 Ideal for smaller commercial kitchens, these dishwashers are the size of a home dishwasher, yet have the durability and capacity for industrial usage. Made in sturdy stainless steel, these front-loading dishwashers feature a large cabinet with a base, plate and cutlery baskets, allowing you to easily load the dishwasher to full capacity. These machines are also a more affordable choice for smaller catering businesses, yet still, offer the highest quality of manufacturing. Fagor’s range includes CONCEPT technology, ensuring their dishwashers robust enough to stand up to high production requirements. Energy efficient, with effective washing and rinsing cycles, the CONCEPT system is essential for modern catering environments. If you have issues with low water pressure, CONCEPT+ technology ensures washing is still completed quickly and to a high standard. Made in stainless steel with electronic components, the CONCEPT range is built to last. Those who run a bar, or simply want a separate machine for glasses, will be impressed by Fagor’s high-quality glasswashers. These specialist appliances sit under counter and have double skinned doors to minimise noise, meaning they’re ideal to install under a bar or in a front of house location. With 90°C rinse cycles, these appliances allow you to clean large numbers of glasses and bring them out looking sparkling clean, ready to use straight away. With cycles from 1.5 to three minutes long, even the busiest bars can ensure they have plenty of glasses on hand to keep things moving. If you are interested in learning more about the Fagor range of dishwashers, call Warewashing Solutions on 1300 217 411, or fill in our online enquiry form to get a call back from one of our experts to discuss your needs.